← Sunday Coffee – Merry Christmas and Happy Holidays! 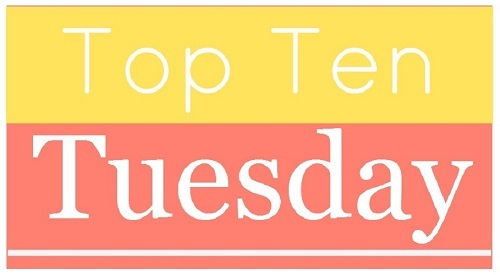 Today’s Top Ten Tuesday asks what we are most looking forward to reading in 2018. As I said back in early November, 2018 looks to be a bit of a dry year for me in terms of book releases by authors I love. I have very few books waiting for me on my TBR pile (physical or virtual), and I’ve done a good job keeping my to-investigate pile pretty low as well. My list of bookish priorities in 2018 is rather small this year in comparison to previous years, but here goes. Like I said, small year, especially given that I’m not sure if any in that last category will actually release. Plus, only a handful of these titles are guaranteed reads – some may be culled as I try the books and move on. Still, I’m hopeful that I’ll enjoy a big chunk of these, and that my small list will give me plenty of time and opportunity to discover new things in 2018! This entry was posted in Book Talk and tagged goals, lists. Bookmark the permalink. I just got a sample of ‘City of Brass’ 🙂 I read so many good reviews, I felt the need to check it out. I read a sample of City of Brass and was instantly hooked. I’ve been waiting for my library to send me a copy ever since! As for the Stormlight Archive, I don’t even come close to having the willpower to wait on those. It took me forever to finally read Words of Radiance, but after that, i was hooked. Hooked is not a strong enough word, haha. I added Lethal White to my list as well in hopes for a 2018 release! Ahhh, I need more Cormoran Strike and Robin adventures in my life! Ooh, I didn’t know there was a date on Zen Cho’s next book. Very excited! Right now it seems to be a tentative date, but I hope that firms up! I hadn’t heard of any of your top five of the year either! This is one reason I love book blogging – I’ve gotten wonderful recommendations from all of you in the past!